'The ability to integrate Search with other digital marketing services offered by a large group is a recurring theme among those Search companies that have been swallowed up. 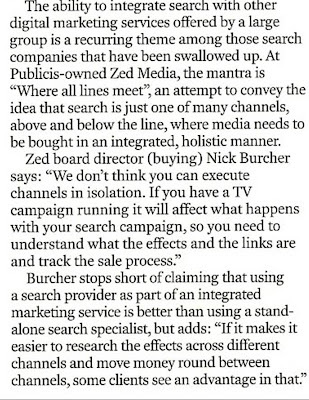 At Publicis-owned Zed Media, the mantra is "Where all lines meet", an attempt to convey the idea that Search is just one of many channels, above and below the line, where media needs to be bought in an integrated, holistic manner. Zed Board Director Nick Burcher says: "We don't think you can execute channels in isolation. If you have a TV campaign running it will affect what happens with your Search campaign, so you need to understand what the effects and the links are and track the sale process."